Holy Family, as an initiating community, nurtures individuals on their faith journeys, challenging them to live the Gospel message as Catholic Christians. The Catholic Church welcomes new members and tries to provide appropriate spiritual formation according to each person’s needs. Some who come to us have had little or no affiliation with, or religious training in, the Christian faith. Others have been baptized and have been active members of other Christian denominations. 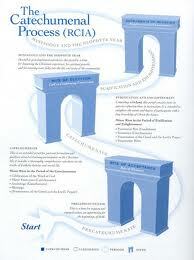 The process of formation is called the Rite of Christian Initiation of Adults (RCIA). RCIA is a communal process and involves a number of stages which lead the unbaptized to the sacraments of baptism, confirmation and first Eucharist at the Easter Vigil at which time they become full members of the Roman Catholic Church. The entire process takes several months or, for some, a few years, but participants are invited to proceed at a pace that individually suits them. RCIA meets weekly, on Monday evenings. RCIA has a gentle ebb and flow. Inquirers usually gather three times during the year: after the New Year, after Easter, and in the fall. As soon as we have a few people, we begin the first stage of RCIA the period of inquiry, also known as the precatechumenate. This phase lasts about six to ten weeks. This is a time of introduction to the Gospel of Jesus Christ and a time of reflection on one’s own life in light of the values of the reign of God. It is an unstructured time of no fixed duration, an opportunity to ask questions and to allow the beginnings of Christian faith to form. Acceptance into the Order of Catechumens. In this liturgical rite (usually celebrated during the 9:30 a.m. or 5:30 p.m. Mass), those who wish to become catechumens publicly express their desire to follow the way of Jesus. The people of Holy Family accept their intention and welcome them into the household of faith as catechumens. The second phase lasts from three to nine months. Along with the whole community, catechumens celebrate the Liturgy of the Word at Mass each Sunday. After the homily, the catechumens and members of the RCIA team (catechists) continue to study and ponder the scriptures and the teachings of the Church. During this time, catechumens receive anointings, participate in prayers of exorcism and blessing, and take part in the mission of the Church to the world. Through prayer, learning and coming to know other Catholic Christians, catechumens discover the love and power of God in their lives and in the Church. Election or Enrollment of Names. At this liturgical rite, usually celebrated on the first Sunday of Lent at the Cathedral of Our Lady of the Angels, the archbishop formally acknowledges the readiness of the catechumens and calls them to the sacraments of initiation. The catechumens respond by expressing their desire for these sacraments. From this time until they are baptized, they are called the elect. On the first Sunday of Lent, the catechumens begin the third stage, which ends at Easter Vigil when the sacraments of initiation are celebrated. During this period, the elect and the parish community together focus on conversion, scrutinize their lives in light of the Gospel and celebrate the presentations of the Creed and Lord’s Prayer. The final stage, Mystagogy, “living the mysteries,” occurs during the fifty-day Easter season and beyond. Neophytes ponder the experience and meaning of the sacraments and participate with the faithful in the eucharistic life of the Church and its mission for justice and peace. Formation and teaching continue for one year to help the neophytes become incorporated into the full life of the Christian community. We are all living the mysteries. Dawn Ponnet is the Director of the RCIA process. She along with about 20 team members share the joys and responsibilities of making the initiation mission a reality. Being an RCIA sponsor is a wonderful faith-sharing opportunity. Share faith and journey with another as that person prepares to embrace the Catholic way of life. Attend as many weekly RCIA sessions as possible. Attend with your candidate or catechumen the rites celebrated at Sunday Eucharist as well as the rite of election at our cathedral church, the Cathedral of Our Lady of the Angels. Share faith with your candidate during the three retreats. Faith-filled and willing to share faith, pray with, and listen to your candidate. To be an outstanding sponsor, one needs to dedicate about three hours per week. RCIA sessions are generally held on Monday evenings, 7:30 p.m.-9:00 p.m. The rites and rituals are celebrated at the Sunday 9:30 a.m. or 5:30 p.m. Eucharistic celebrations. For some catechumens, the process takes about one year, while the journey for others can be as short as five months. Each journey of faith is unique. Three sponsor meetings are held during the initiation process, where a team member describes the role and responsibilities of a sponsor. Sponsors engage in lively discussion and support one another. If you or someone you know is interested in learning about the Catholic faith, please get in touch with us. You may complete the RCIA Interview Form in advance or during a meeting with the Director of Initiation.